You found the right website if you are looking for the Best VoIP Phone Service in Fort Collins, CO or anywhere in Northern Colorado. We are locally owned and operated, and have technical and support staff experienced in implementing and supporting VoIP Phone Service. For an immediate free no-obligation consultation call us now at 970-795-1000 or complete the contact form. Or you can find out more about us by viewing our testimonials or about us page. If you are looking for more information on the Best VoIP Phone Service options read on. Did you know that some of the biggest employers in Fort Collins including Colorado State University and the City of Fort Collins operate on VoIP phone systems? In its simplest terms, VoIP phone service means transmitting Voice over the internet. By contrast, traditional phone service is transmitted over copper wires. The infrastructure is in place to route phone calls back and forth between the internet and the copper circuits. This allows VoIP phone service to work and typically VoIP service is a fraction of the cost of traditional phone service. IS VOIP PHONE SERVICE IN FORT COLLINS FOR YOU? Is my internet connection reliable? Can my business tolerate a phone service disruption if my internet goes down? Is my telecom spend too high? Would I benefit from the features available in a VoIP Phone System, such as mobility or working remotely? In general, answering yes to all of these questions means you should seriously consider a VoIP phone system. Even if you answered no to some of these questions a VoIP System could be right for you. Our experts will determine the best VoIP system for your needs and take into consideration your requirements to design the best VoIP solution to fit your needs and budget. Call us today for a free consultation. There is much confusion about VoIP as it relates to premise or cloud-based phone systems. Many people think of VoIP phone systems as being the same as a cloud phone system. In reality, a premise based pbx can be either VoIP or non-VoIP. On the other hand, hosted phone systems are almost always VoIP phone systems. Learn more about whether Premise or Hosted is right for you by reading our tutorial or call us now for a free consultation. VoIP comes in different flavors. You don’t have to go fully VoIP. You can implement a hybrid VoIP system where your phone lines are traditional analog or PRI, and your phones are IP. Conversely, you can implement a hybrid VoIP system with digital phones and SIP trunks. You can also implement a VoIP system with a mix of analog, PRI, SIP trunks, and digital or IP phones. A great hybrid VoIP phone system like Avaya allows you to grow into a VoIP phone system if you are not quite ready to take the plunge now. Our experts can guide you through determining the best way to configure a phone system. Hot Desking: This is the ability to move your extension by logging into a phone somewhere on your network. This is very handy for companies with employees that frequently visit other locations. Mobile Twinning: This is the ability to ring two phones simultaneously, such as your desk phone and your cell phone. SIP Trunks: This replaces traditional analog or POTS (Plain Old Telephone Service) lines with internet-based phone service. The advantages include a lower cost per channel or call path, long distance is usually included and unlimited, some SIP trunk providers allow for call bursting which is the ability for you to receive more phone calls than call paths you are paying for. There are numerous other features only available in a VoIP phone system. For more information call us now for a free consultation. Is your business prepared to use a VoIP phone system? One of the issues we look at is what kind of wiring do you have? The good news is there are many ways to implement VoIP, so you don’t necessarily need to install cat-5 or cat-6 wiring if you already have it in place for your internet service. VoIP phone service can share the same wiring as long as you configure your network properly and use a switch that has the intelligence to manage and separate the voice and data traffic. Another thing we check is the stability and speed of your bandwidth. An initial test can be done with a tool such as speedtest.clearfly.net. This will give you an idea of whether your existing internet connection will be reliable enough to handle VoIP traffic. If you have multiple locations and want to network them together, the testing gets more complicated buy it can be done by an experienced VoIP phone company such as Firefly Telecom. Still not sure? 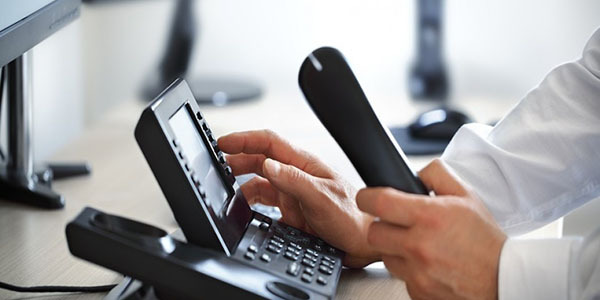 The best thing to do is to call or email us now for your free no-obligation consultation on VoIP Phone Service in Fort Collins.